March 19, 2017. 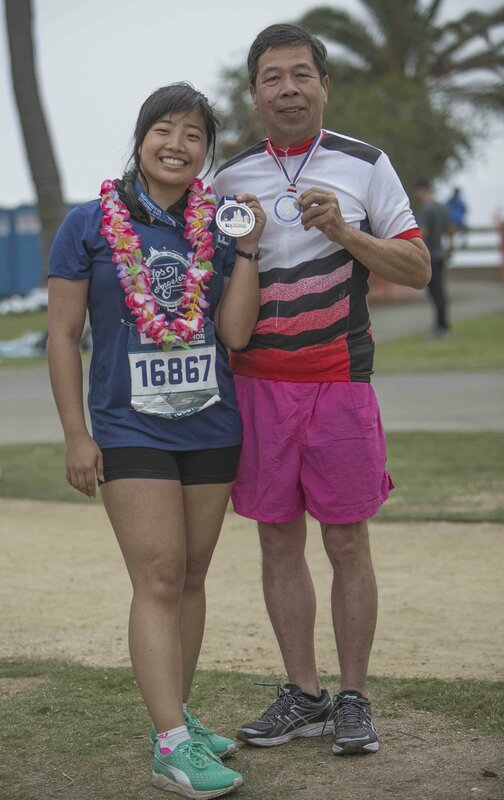 Kathy Pho (left) shows off her medal after completing The La Marathon and stands with her father Que Pho (right) who ran The LA Marathon in 1994 show off his medal. Kathy Pho finished the marathon in five hours fourty nine minutes fifty four seconds. Santa Monica, California. Photo by Daniel Bowyer. Santa Monica College Acssociated Students Activities Director, Kathy Pho (right) and her father Que Pho (left) converses with thei family as she prepares for the 2017 Skechers Performance LA Marathon on Sunday March 19, 2017 at the Dodger Stadium in Los Angeles, CA. Photo by Marisa Vasquez. Santa Monica College Acssociated Students Activities Director, Kathy Pho (right) stretches before her 26.2 mile treck as preporation for the 2017 Skechers Performance LA Marathon on Sunday March 19, 2017 at the Dodger Stadium in Los Angeles, CA. Pho's Father, Que Pho (left), snaps a picture of her as she focuses on the 26.2 mile run she has been training for. Photo by Marisa Vasquez. Santa Monica College Acssociated Students Activities Director, Kathy Pho (right), her younger sister, Katrina Pho (middle), and her father, Que Pho (left), look out over the croud of runners and supported of the 2017 Skechers Performance LA Marathon on Sunday March 19, 2017 at the Dodger Stadium in Los Angeles, CA. Photo by Marisa Vasquez. Santa Monica College Acssociated Students Activities Director, Kathy Pho (right) stretches before her 26.2 mile treck as preporation for the 2017 Skechers Performance LA Marathon on Sunday March 19, 2017 at the Dodger Stadium in Los Angeles, CA. Photo by Marisa Vasquez. Onlookers live stream the wheel chair starting line that kicked off the 2017 Sketchers Performance LA Marathon on Sunday, March 19, 2017 at the Dodger Stadium in LA, CA. Photo by Marisa Vasquez. The marine layer engulfed Dodger stadium at 5am on a Sunday morning. 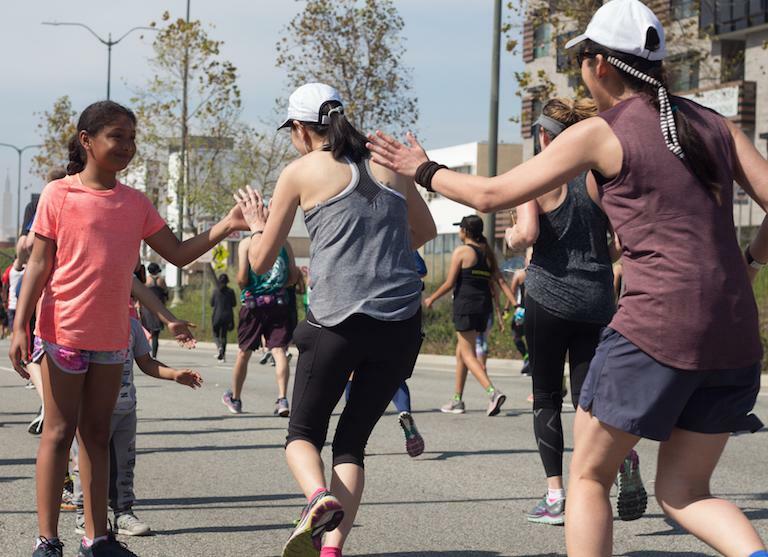 Runners from all over the world gathered to celebrate healthy exercise and the city of Los Angeles. Despite the thick fog, the runners were ready to take on a mammoth challenge. 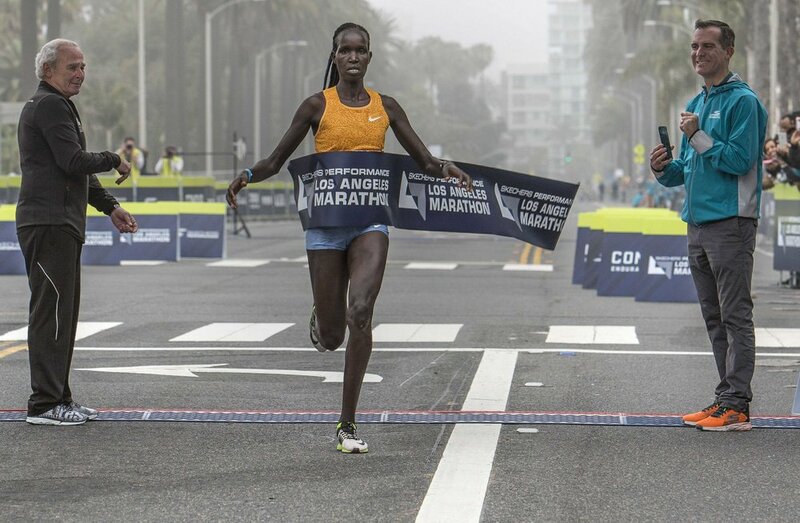 This year’s top female athlete, Hellen Jepkurgat, traveled to Los Angeles from her home in Kenya to compete in the elite female athlete category. Despite being held back by her pace group, she finished first with an impressive two hours thirty-four minutes and twenty-three seconds according to the official L.A. Marathon tracker. Jepkurgat had a hard time keeping the same pace as her fellow runners. According to Los Angeles Daily News, the pack of women racers “kept clipping her heals” and showed “no interest” in upping their pace.